Now it’s time to welcome a newcomer to the stand mixer scene. With its premium finish and incredibly strong die-cast construction, KitchenAid’s new KSM177 Stand Mixer makes light work of the biggest of culinary tasks. Equipped with a powerful yet energy-efficient motor, this mixer utilises direct drive transmission and planetary mixing action to ensure all of your ingredients are thoroughly mixed through. With ten different mixing speeds to choose from, the KSM177 provides you with total control at your fingertips while the included attachments help you to beat, whisk and knead with ease. Available in a range of colours to best suit your home, the KSM177 is KitchenAid’s most versatile stand mixer to date. Equipped with a powerful yet energy-efficient 300 watt motor with direct drive transmission. 10 mixing speeds to choose from. Includes two differently-sized stainless steel bowls to best suit your task. Multi-purpose attachment hub lets you attach other KitchenAid attachments (Sold Separately). 4.8L Stainless Steel Mixing Bowl. 2.8L Stainless Steel Mixing Bowl. 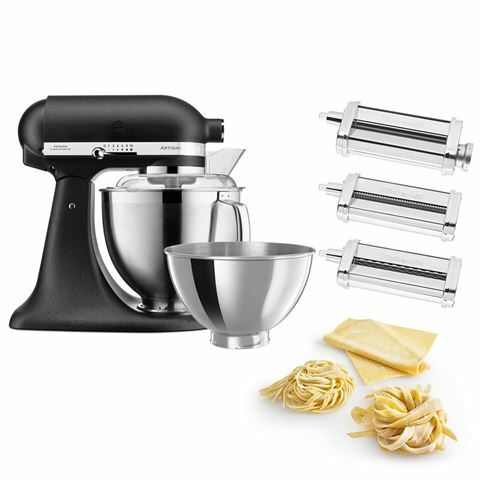 BONUS 3-Piece Pasta Roller Set. Dimensions: 35.8cm (l) x 35.3cm (h) x 22.1cm (w).